Parents of Ethel, Martha, Lillian, Olive & Raymond, William & Anna were double first cousins. Delila Vanbibber , b. Nov. 18, 1817, Ohio, Daughter of Jacob & Unknown, Step-Mother of Clinton Strong, Married: John Strong, 10 Nov 1842 Vanderburgh Co. IN. 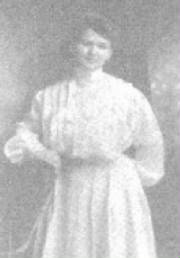 Lillian "Lily" Van Bibber , b. Oct. 1881, Vanderburgh Co. IN. Daughter of William Albert & Ann Mary Sutton Van Bibber, Married: Sigmund Eichel, 03 Sep 1903 Vanderburgh Co. IN.